B&W has produced one of the best-sounding wireless headphones you can buy for less than $500. Can you be too isolated? 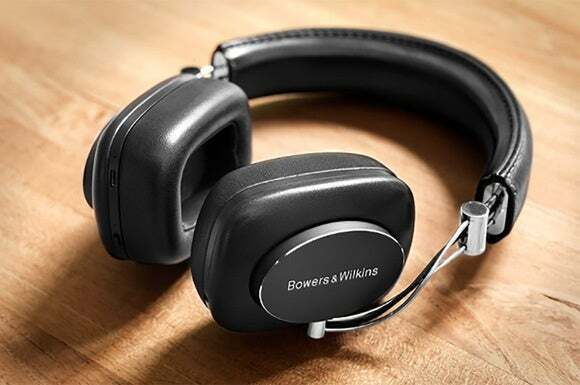 Bowers & Wilkins has earned its place as the BMW of high-end audio. The company’s loudspeakers are legendary: Its five-figure Nautilus speakers have been displayed in museums; Abbey Road Studios has used their monitors for more than 20 years; and the company’s new 800 Series Diamond (which I auditioned during last year’s NYC launch event) are receiving rave reviews. 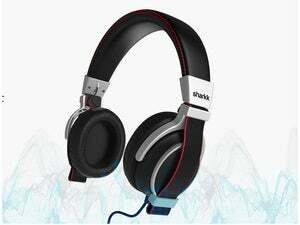 The company’s headphone line, on the other hand, has been the black sheep in the family. The wired versions have been judged as pretty good, but not truly great; they’ve certainly never achieved the acclaim afforded the company’s best speakers. 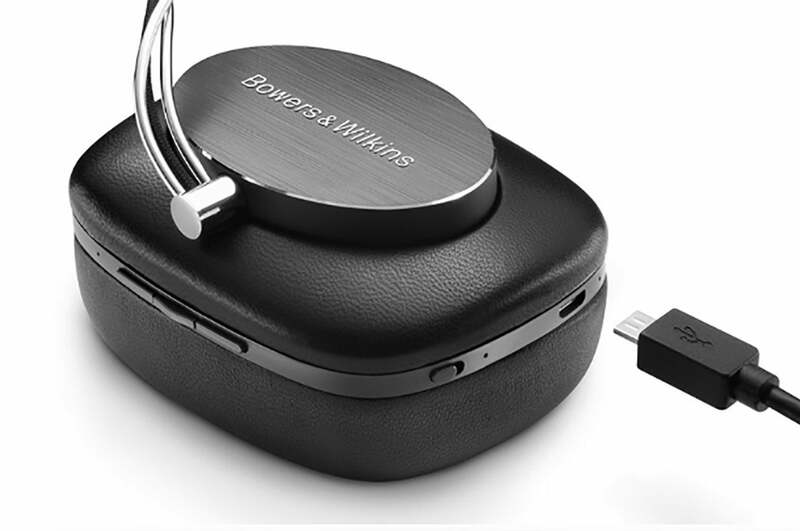 Just before Apple’s iPhone 7 announcement, Bowers & Wilkins upgraded its P7 over-the-ear model to Bluetooth. The question on just about every audiophile’s mind is whether this new model simply adds wireless capability to the previous generation, or if it ups the ante. I was among the first reviewers to get my hands on the B&W P7 Wireless, so I was anxious to find out. B&W magically transitioned its luxurious P7 headphones to Bluetooth and made them sound even better than the wired version. 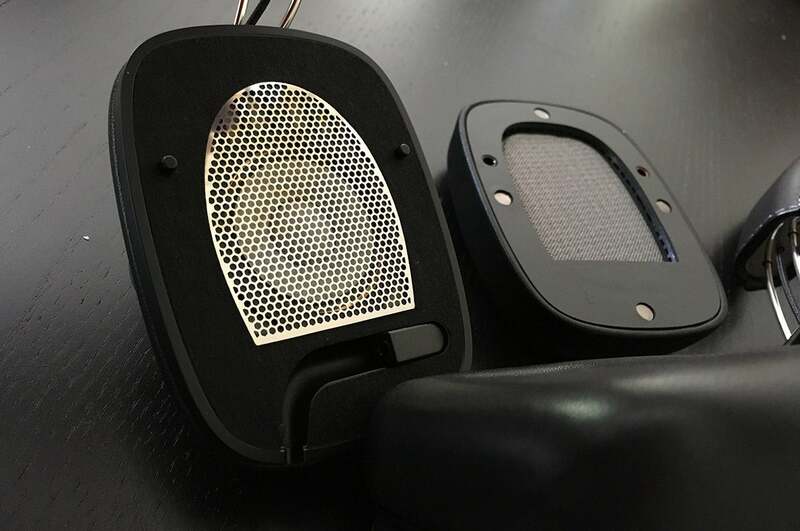 The new P7 Wireless are easily mistaken for the original. I placed the new model next to its wired forerunner, which I’ve owned for quite some time, and found the two virtually indistinguishable. 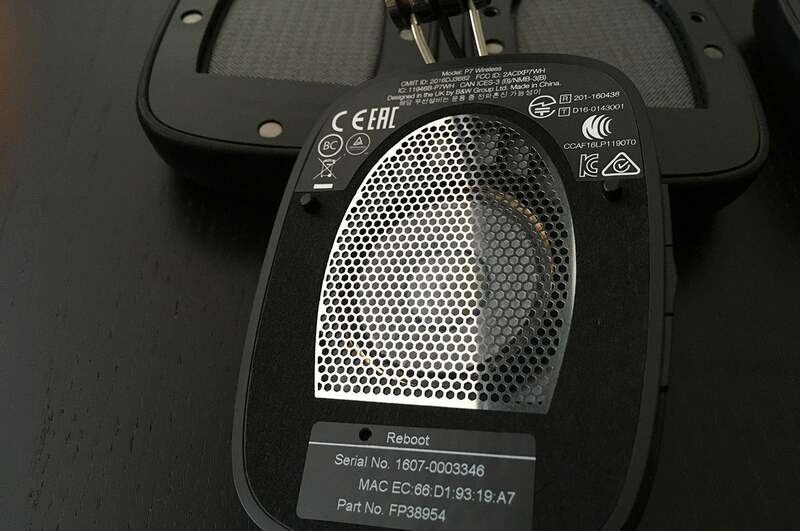 Even their spec sheets look alike: two 40mm full-range drivers, impedance of 22 ohms, frequency response ranging from 10Hz to 20kHz, and sensitivity of 111dB/V at 1kHz. The P7 wireless are a hair heavier at 323g vs 290g. The Bluetooth 4.1 P7 Wireless omits the chrome accent around the ear cups, and while I was sorry to see that feature cut, it has zero impact on performance. A three-button remote control has been added to the right ear cup, as well as a power switch and a micro-USB charging port on the bottom. With all the controls now on the right side, the wired input remains on the left ear cup. The ear cups are magnetic, as they were on the original. To switch to wired mode, remove the left-hand cup, insert the 2.5mm angled end into the articulating input, and you’re set. Plugging in the cable immediately disables Bluetooth, but removing the cable doesn’t re-enable Bluetooth. You must power the headphones back on again manually to do that. The B&W P7 Wireless have magnetic, replaceable ear cups. The left ear cup (shown above) also has an input for wired mode. There’s nothing cheap or flimsy with these headphones. The P7 Wireless simply spoil you with their luxurious fit and feel. 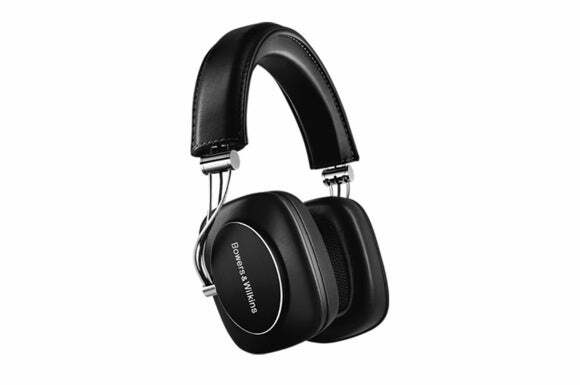 There aren’t many headphones under $500 (or twice the price, for that matter) that can keep up with Bowers and Wilkins in this regard. In my book, the P7 Wireless are a gold-standard. The genuine sheep leather headband and ear cups are smooth, soft, and supple. The sleek-looking aluminum frame is sturdy and infinitely adjustable. The headband guides, conceals, and automatically expands and contracts the nylon-braided wire connecting each ear cup. The engineering is a thing of beauty. The headphone design gets even better. Many over-the-ear headphones aren’t portable—they’re just too bulky and they can’t fold flat. 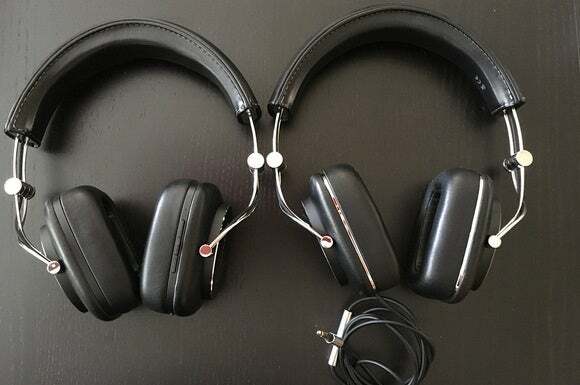 B&W has solved this problem by inserting a rotating joint between the edge of the headband and the ear cup arm that allows you to fold the headphones to half their size. Brilliant. The accessories have been pored over just as meticulously. The included carrying case is smooth, lined with velour, and snaps closed with a magnetic flap. That’s industrial design done right—down to the smallest detail. Remove the right magnetic ear cup to see the headphone’s serial number and Bluetooth reset button. 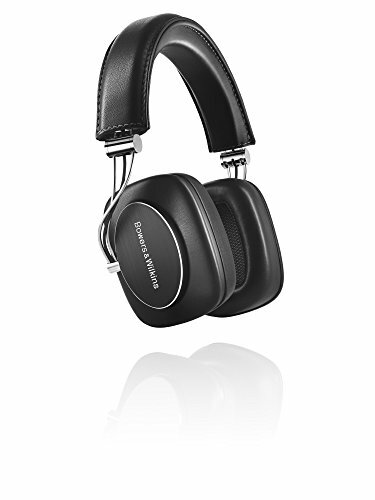 You should treat the P7 Wireless like a new pair of designer jeans: They need to be broken in. As with every other B&W headphone I’ve owned (the P5 wireless and the original P7), the new P7 Wireless are stiff and overly-snug when you first put them on. Trust me, they’ll loosen up over time. Once you’ve broken them in, they’ll fit like a glove. Don’t be afraid to flex the metal frame a bit (within reason, of course) to loosen things up more quickly. Once you get used to the P7s, you’ll notice that other headphones will seem far too loose and won’t stay on your head as precisely as the P7s do. You can jog with them without worrying that they will shift or slide off. Perhaps most importantly, they’re exceedingly comfortable ever during long listening sessions. I wore them for three, four, five hours at a time without a problem, and my ears were never trapped in a sweat chamber. There’s one qualifier to that point, however; the ear cups are said to be made of memory foam; but unlike most memory foam ear cups, these remain stiff and keep their shape. 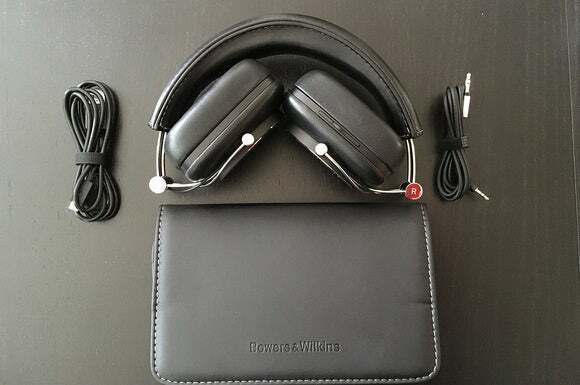 The P7 WIreless includes a soft carrying case, USB charging cable, and 3.5mm cable. That stiffness creates a stable pocket for your ears. The ear cup design may not be for everyone, but it creates a consistent environment for the audio drivers to work in. Pressure around your ears is also very even, though it’s shy of the almost perfect fit of the V-Moda Crossfade Wireless headphones. B&W’s P7 Wireless headphones are outstanding at sealing out ambient noise. My family was mad at me on more than one occasion for being completely oblivious to what was going on around me. Wearing the P7 Wireless literally puts you into your own world. The headphones also passed the ambient audio torture test. No, not an airline cabin. Starbucks. Slap on the P7 Wireless, turn on your tunes, and you won’t even notice who’s ordering a cappuccino or what’s playing on Starbucks radio. When it comes to documentation, B&W seems to have taken a page out of In-n-Out’s playbook. The California-based restaurant is known as much for its secret menu as its great burgers (order a “4x4” and you’ll get four beef patties and four slices of cheese). The P7 Wireless comes with a quick-start manual, which is fine for getting up to speed quickly, but you won’t know about several nuanced (and important) elements unless you download the full manual from here. You turn on the P7 Wireless by sliding the power button on the right ear cup to the right (pull it forward if the headphones are on your head). To pair with a Bluetooth device, press that same button down and hold it for a few seconds. Don’t get confused between the two. In my tests, pairing the P7 Wireless was always flawless—whether it was an iOS or Andriod device or an Astell&Kern media player. Take note that whichever device you pair first with the P7 becomes the primary device for Bluetooth auto-connection. B&W says the P7 Wireless can remember up to seven secondary devices. The P7 Wireless (left) is almost indistinguishable from the original P7 (right). Don’t worry too much about the music running out. 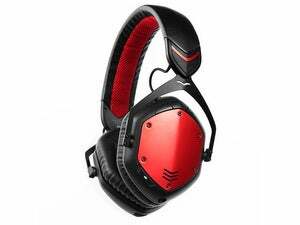 The P7 Wireless are rated to rock up to an awesome 17 hours. A green, yellow, or red light on the left ear cup tells you the current battery life. A green light means that the battery is above 30-percent charged. Yellow means that the battery is between 10- and 30-percent charged. Red means the battery is less than 10-percent charged. If the indicator blinks red, then battery is too low. At that point, you must use the P7 in wired mode until you recharge. If you do use the P7 Wireless in wired mode, here’s an important item to note: the included cable doesn’t have an inline remote, which leaves you no means to control your iOS or Android device remotely. The controls on the left ear cup don’t work. I don’t know why B&W thought this was a good idea; I was able to use the inline remote cable from the original P7 without a problem. As similar as the P7 look to the original P7 wired, they sound completely different. In fact, they sound so fantastic that they’re a worthy upgrade even if you never use them in Bluetooth mode. That’s because B&W came up with a whole new set of transducers. I immediately noticed the difference with the first track I listened to: Adele’s “He Won’t Go” from 21. The kick drum, which was quite reserved on the original P7s, literally gave me a visceral kick on the new P7s. Bass was punchy, dynamic, and thoroughly satisfying on just about every single source and track I played. However on some tracks, I could say that the bass was perhaps a bit too energetic. Put in any exceptional Chesky recording, like Alexis Cole’s Dazzling Blue or City of the Sun’s To the Sun and All the Cities in Between and the P7 Wireless just sparkle with a precise and deep sound stage. With the P7 Wireless, music was warm, engaging, and alive. This adjustment is a very welcome addition and addresses the sonic shortcomings of the original. Improved bass response doesn’t mean B&W suddenly discovered hip-hop. You can take the P7s to the ball, too. The P7 Wireless handled the most intimate and delicate notes of Yo-Yo-Ma’s Cello from Yo-Yo-Ma Plays Ennio Morricone. The cellist’s work on “Gabriel’s Oboe” was warm and simply invited me into an oasis of pure bliss. The depth and breadth of piano notes on “Debora’s Theme” from Once Upon a Time in America was enthralling. The hairs on my arms were still standing when the penultimate track, “Dinner” from Lady Caliph, came on. That’s the type of emotion the P7 Wireless elicits. I view wireless as a convenience, not as a reference standard. My opinion hasn’t changed after testing out the P7 Wireless. I tested the P7’s aptX Bluetooth connection with an Astell&Kern AK70. It sounded good but lacked the finesse, detail, and air you get when you plug them in. There’s still no substitute for a wired connection. 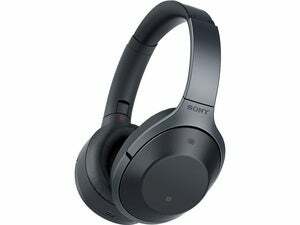 The P7 Wireless charges via a micro USB port under the right ear cup. That being said, if you own a headphone amp, by all means use it with the P7 Wireless. You’ll notice even more refinement. Comparing the P7 Wireless with a NuForce uDAC5 (currently in for review) versus the internal headphone jack of a Macbook Air was night and day. With the NuForce uDAC5, bass was more controlled, much tighter, and not as forward. The midrange was more defined and three-dimensional. The top end too was more precise. B&W’s P7 Wireless headphones won’t be treated like second-class citizens in B&W’s lineup. These headphones are a major step forward for B&W—not simply because of the addition of Bluetooth, but also for the effort that B&W put into fine-tuning the voicing in the new model. These aren’t just good wireless headphones. B&W’s P7 Wireless are great headphones, period.